Much of the early history of Japanese Americans has concentrated on the experiences of men. When Japanese immigration to the U.S. began in the late nineteenth century, men comprised the vast majority of migrants. Issei (first generation) women have often been considered "pioneers" because they came to America leaving behind family and a social network that was familiar to them. Upon entering the new country, they often experienced culture shock and social isolation, but found many different ways to cope and adapt to these new experiences. One of the earliest Japanese women to arrive in America was Okei Ito. In 1869 she came with a group of Japanese immigrants who started the Wakamatsu Tea and Silk Colony in California. The colony failed and she, at the age of nineteen years, tragically died in 1871. Ito's story is unusual because she arrived at a time when there were so few Japanese women in the United States. For the most part, Japanese women did not immigrate in large numbers until the beginning of the twentieth century. The passage of the Gentlemen's Agreement in 1907 cut back on the number of male Japanese immigrant laborers. I did not prevent the wives of Japanese men already living in the United States from immigrating. Thus, beginning around 1908, increasing numbers of women came from Japan. Japanese men began to settle down and send for wives from Japan. These women have been commonly referred to as "picture brides" (shashin kekkon). These marriages were often arranged by a marriage arranger or baishakunin, who knew the bride and groom's families. Pictures of the prospective bride and groom would be exchanged and the marriage would take place in Japan. She would be issued a passport as the wife of a Japanese laborer in America and would then make the long journey to meet her husband. Yukino Ezaki (left) and friend sort pears in 1920. In addition to raising the children and caring for their modest homes, the Issei women worked right alongside their husbands in the fields and orchards. National Archives. There are many reasons why a Japanese woman might find it desirable to come to America. In the United States, she would not have to live as lower status person in the household, and be subjected to the authority of her mother-in-law. She might find greater freedom, autonomy, and adventure& — something that would not have been possible in Meiji-era Japan. Some picture bride marriages fared well, others were more difficult with large age gaps between the much older husband and young wife. In anticipation of marriage, men sent pictures of themselves that might be younger than they really were. The pictures might have shown material wealth, a big house or car that they really did not have. The realities were often far from the truth, but these marriages often endured because of the expectations of duty and obligation that husbands and wives had for one another. 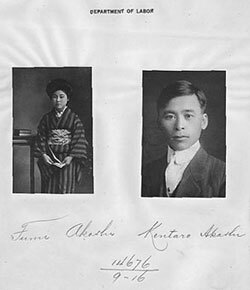 Kintaro Akashi (right) shown with his picture bride, Fumi (left) in this labor document from 1915. National Archives. With the arrival of women, families began to form and the Japanese American community became less transient. Instead of single male laborers moving from place to place following the demands of work, major cities established community centers — Japantowns or Nihonmachi as the community base. There, important social connections were established among these early immigrant families. The children of the Issei were called Nisei, or second generation. Born in America, they were U.S. citizens, unlike their immigrant parents. They lived in a bicultural world&#8212;often speaking both Japanese and English. Nisei were educated in American schools, but grew up in the Japanese American community. The majority of childrearing responsibilities fell upon women, and they were responsible for passing on Japanese language and culture to their children. Issei women met with the harsh economic and social realities that many immigrant women faced. They often had to work the "double day" taking care of children and family along with working in paid work to help in family earnings. For Issei women in the Santa Clara Valley, this meant farming and other agricultural work. In more urban areas, women worked in family owned businesses (such as laundry, dry goods stores, boarding houses and hotels), or as domestic workers. Overall, Issei women's involvement was with their families and they were an integral part of Japanese American community life. Because of the sensitivity of this subject, there are few books on the Japanese American female experience in pre- and post-World War II America for younger students. We hope that new works will be eventually published for this age range. Say, Allen (2004) Music for Alice, Houghton Mifflin, ISBN: 0618311181. Allen Say writes a gentle true story about Alice and her childhood on a California farm. Alice loves music and dancing and dreams often of being a dancer. Years pass and Alice grows up and marries. World War II breaks out and the forced evacuation starts. Instead of going to camp, Alice and her husband are sent to work on farms in desert areas to grow food for the war effort. The book follows them through the post-war years. This is a "picture book", but the prose, topics, and illustrations provide ample material for thought provoking discussions. The book does describe the life of a strong Nisei woman in a story that children will understand. Reading level: third through fifth grades. Say, Allen (1999) Tea With Milk, Houghton Mifflin, ISBN: 0395904951. This book, which is written and illustrated by Say, tells the story of his mother Mai. She was born and raised in San Francisco and in the 1930's, her Issei father chose to move the family to Japan. Mai, just graduated from high school, had no choice but to accompany her family. Though primarily about Mai's difficult adjustment to Japanese culture, Tea With Milk gives a glimpse into what life in a traditional Japanese home was like for women in the 1920's and 30's. Reading level: third through fifth grades. Uchida, Yoshiko (1993, 2nd edition) A Jar of Dreams, Alladin, ISBN-10: 0689716729. This is the story of Rinko, a young girl growing up in California, and her close knit family -- Issei parents, and two brothers. Set in the 1930's, the book gives a view of what it was like to be Japanese American in a largely white community. When Rinko is 11 years old, Aunt Waka comes from Japan for a visit and infuses the family with enough confidence to go forward with their dreams for the future. This is a complex story about the roles of women, conflict between generations and cultures, told in a way that third through fifth graders would understand. 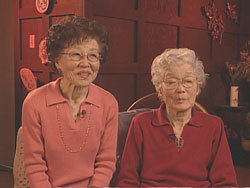 Glenn, Evelyn Nakano (1988) Issei, Nisei, War Bride: Three Generations of Japanese American Women in Domestic Service. Philadelphia: Temple University Press, ISBN: 0877225648. Nakano surveys the lives of Japanese American women who worked in domestic service and how this type of employment affected both community and family life. Hara, Marie (1994) Banana Heart and Other Stories, Bamboo Ridge Press, ISBN 0910043337, Reading level, middle school. Hara's book is a collection of stories about Japanese American women in Hawaii during different stages of their lives including picture bride, plantation worker, etc. Kikumura, Akemi (1981) Through Harsh Winters, The Life of a Japanese American Woman. Chandler & Sharp, ISBN 0883165430. Loveridge-Sanbonmatsu, Joan, Imperial Valley Nisei Women: Transcending Poston (2006) New Persephone Press, ISBN 0977976904. A collection of oral histories of five articulate Japanese-American women whose young lives had been interrupted by Executive Order 9066, a presidential order on 2/19/42, which put 120,000 persons of Japanese ancestry behind barbed wires during World War II. Maruyama, Milton (1994) Five Years on a Rock, University of Hawaii Press, ISBN: 0824816773. This is the second book in a series of fictionalized books about the Oyama family of Hawaii. It is the story of Sana, a young bride sent from Japan to be the wife of the oldest Oyama son and her belief that after five years, she will be able to return to Japan. Nakano, Mei (1990) Japanese American Women: Three Generations 1890-1990. San Francisco: National Japanese American Historical Society and Berkeley: Mina Press Publishing, ISBN: 0942610067. Nakano surveyed these generations of Japanese American women and shows how their cultural values helped them adapt to the hardships of a new country. Nakano also describes the lives of Nisei women who's experiences were shaped by World War II, and today's Sansei women who juggle tradition with American "norms." Sone, Monica (1953) Nisei Daughter. University of Washington Press, ASIN: 0316803987. This autobiographical story is about Sone's childhood in Seattle, Washington, where she grew up half in the Japanese world, and half in the American world. She recounts her family's experience of being relocated to Topaz, Utah. Uchida, Yoshiko (1997 new edition) Picture Bride, A Novel, University of Washington Press, ISBN-10: 0295976160. Uchida tells the fictionalized story of young Hana Omiya, who arrives in pre-World War II America to wed an older storekeeper, Taro. The book follows Hana and Taro and daughter Mary through the years and includes internment. Yamamoto, Traise, Masking Selves, Making Subjects: Japanese American Women, Identity, and the Body (1999) University of California Press, ISBN: 0520210344. This study is the first to situate Japanese American women's writing within theoretical contexts that provide a means of articulating the complex relationships between language and the body, gender and agency, nationalism and identity. Japanese American Women: A Sense of Place, Rosanna Yamagiwa Alfar, Leita Hagemann, director (1992) available from Women Make Movies, www.wmm.com. In this production, producer/director Rosanna Yamagiwa Alfaro and 12 other Japanese-American women dispel the stereotype of being "docile" and "submissive" as they express their feelings about their race and the unique position they have been put in from being "neither Japanese nor American." Eventually, some Issei saved enough money to open small stores, laundries, hotels, and restaurants. The wives worked right alongside their husbands and when the children were old enough, they were also expected to help out. Above, the Okita Brothers store in San Jose's Japantown in the early 1900's. California History Center Archives. Mary Yoshikawa and her 102 year old mother, Suenyo Inada from the KTEH documentary, Return to the Valley. Mrs. Inada was perhaps the last of the Issei pioneer brides in the Santa Clara Valley. She came to America as an eighteen year old in 1920 to marry her husband, a strawberry farmer.